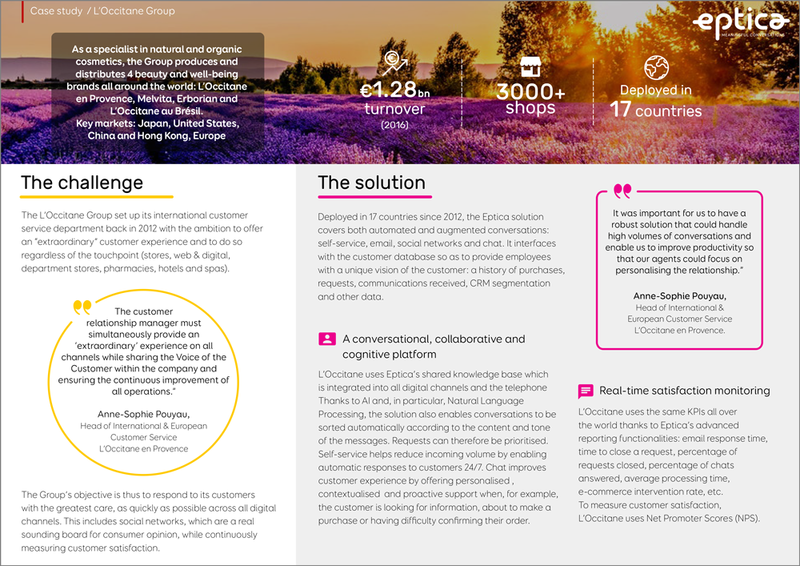 L’Occitane Case Study | Eptica - Multi Channel Customer Interaction Software. Email Management. Web Self-service. Live Chat and Agent Knowledgebase. As a specialist in natural and organic cosmetics, the Group produces and distributes 4 beauty and well-being brands all around the world: L’Occitane en Provence, Melvita, Erborian and L’Occitane au Brésil. L’Occitane Group has over 3000 stores across 90 countries. Through its major international CRM systems upgrade project, L’Occitane intends to offer its millions of customers around the globe a more seamless and customer-friendly cross-channel experience. L’Occitane’s quality of service and customer guarantees needed to be identical when dealing with any major international issue, across all networks and all continents.